Director Wong Kar Wai’s (王家衛) The Grandmaster <一代宗師> received fourteen nominations for this year’s Hong Kong Film Awards, followed closely by director Dante Lam’s (林超賢) Unbeatable <激戰> with eleven nominations. The winners will be announced on April 13. Now in its 33rd year, the Hong Kong Film Awards were criticized the previous year for lacking suspense, with police thriller Cold War <寒戰> easily winning nine out of its eleven nominations. However, the competition is expected to be much more heated this year now that many of Hong Kong cinema’s biggest names have trekked back to the arena. The Grandmaster, a biographical film about martial arts legend Ip Man (葉問), led the pack of nominees with fourteen nods, including Best Film and Best Director. Wong Kar Wai, will duke it out with Dante Lam, Johnnie To (杜琪峰), Benny Chan (陳木勝), and Derek Kwok (郭子健) to see who will win this year’s Best Director Award. Although Stephen Chow (周星馳) did not net a nomination for his directing work on Journey to the West: Conquering the Demons <西遊·降魔篇>, the film itself did receive a nod for Best Film. Journey to the West is up against powerhouses The Grandmaster and Unbeatable, as well as crime thriller The White Storm <掃毒> and dance flick The Way We Dance <狂舞派>. In an interesting twist, two of this year’s Best Actor nominees portrayed the same character, Ip Man, though in different films – Tony Leung Chiu Wai (梁朝偉) in The Grandmaster and Anthony Wong (黃秋生) in Ip Man: The Final Fight <葉問：終極一戰>. Joining the scuffle for Best Actor are Louis Koo (古天樂) and Sean Lau (劉青雲), both from The White Storm, as well as Nick Cheung (張家輝) from Unbeatable. For the first time in six years, Best Actress may be awarded to a mainland Chinese actress, namely Zhang Ziyi (章子怡) for The Grandmaster or Tang Wei (湯唯) for Finding Mr. Right <北京遇上西雅圖>. Their fellow nominees include Nina Paw (鮑起靜), Sammi Cheng (鄭秀文), and newbie actress Cherry Ngan (顏卓靈). Mainland Chinese actresses had previously snagged the Best Actress Award four years in a row, from 2004 to 2008, after which Hong Kong actresses began expressing their discontent with the situation. Last year, mainland Chinese actress Zhou Xun (周迅) was nominated twice for the award but lost to Miriam Yeung (楊千嬅). Nothing extremely spectacular about The Grandmaster. Unbeatable was heaps better. I’m rooting for Nick Cheung and Eddie Peng for Best Actor and Best Supporting Actor respectively. Jayne, Unbeatable has 11 nominations, not 9. Sammi Cheng for best actress !!! I’m personally supporting Anthony Wong for Best Actor. Ip Man: the Final Fight may have the lousiest title of the films here but it is one heck of a film and I’m a bit surprised that it did not snag a Best Pic nod. Anthony Wong turned out a great performance in the film, a textbook in masterful controlled and low key but resonating acting which shows great respect for Master Ip Man himself compared to other actors portraying the same role (yes, including Donnie and Tony). Of course Nick Cheung also turned out the stellar performance of his career in Unbeatable and may possibly nag the big prize as well. Will they do a tie like the Golden Horse Award did for Nick Cheung and Huang Bo several years back? Also, I enjoyed The Grandmaster a lot. Easily the most accessible of all Wong Kar Wai’s works and one that see him starting to move on into a new more mature direction in his film-making vision. Unbeatable was good but nothing special. A solid commercial fare that we have come to expect from Dante Lam but thankfully with less of the inconsistencies and showiness plaguing The Viral Factor. The Dark Horse in the Best Pic competition may turn out to be The Way We Dance. This is another one of my fave from last year. Starring lesser known names but with winning heartwarming performances that never strays into the melodramatic department. Best Director is basically the same old names from HK’s current top crop with the kinda new blood being Derek Kwok but When The Light Goes Out unfortunately is not strong enough to compete with the other nominees. So my pick (yawn) would be either Wong Kar Wai, Johnny To or Dante Lam. I would of course like to see the meta-horror film Rigor Mortis take both the Supporting Actor and Actress Awards for purely sentimental and nostalgic reasons. It’s nice to see Anthony Chan in a juicy role where he has a lot more to do and for Kara Hui to once in a while go a bit loony. Best Actress should be Zhang Ziyi’s. The girl has practically nabbed everything on the table in the Asian film awards circuit for this particular role and she was quite amazing in it. In fact, I would say that The Grandmaster is more focused on Gong Er than Ip Man for a film marketed as an Ip Man biopic. But sentimentally, I’m also rooting for Nina Paw for her exceptional against type performance in Rigor Mortis. The way Nina portrays her character’s spiraling journey from a kind and vulnerable soul to a murderous, selfish and slowly growing insane unlikable character was imbued with believability and pathos unlike any I’ve seen last year. Though I’ll also say that they could nominate better performers from other noteworthy films last year than Louis Koo and Lau Ching Wan for the two Best Actor spots. The White Storm is grossly overrated and these two did not even turn out their finest performance to warrant the nominations and to nominate them for these roles are an insult to even their own reputation as actors as far as I’m concerned. You know not like 3 hours ago I read your post about Anthony Wong and then I caught the same movie on TV and just finished just now. Story wise it was like not going anywhere but I must admit, when I read Anthony Wong as Ip Man, it will be terrible. That is because in my mind it is entrenched with this heroic image of Ipman when in real life Ip Man looked rather … ordinary. Whilst the accent come and go, I thought Anthony Wong gave a subtle controlled virtuoso performance. I may hate his brash ways and loud personality and arrogant egoistical persona in real life but Anthony Wong, like Francis Ng can really really act. Impressive stuff. But the movie was just so-so. Thanks for your short reviews and thoughts. I have not seen some movies on that list yet (working on it) but I agree with you on Anthony Wong’s (and Herman Yau’s) interpretation of this legendary figure. In a way, I thought Wong’s Ip Man was the most accessible and ‘relatable’ compared to other screen versions because we get to see his frailties as he aged within the political and economic context of the time. 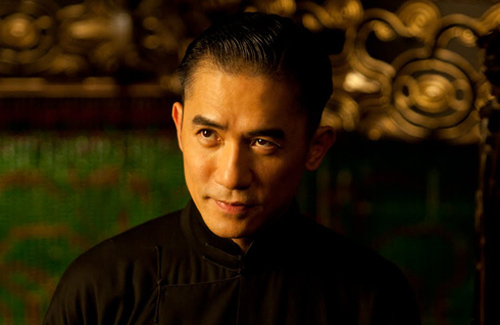 I liked Wong’s portrayal more than I did Tony Leung’s in the Grandmaster. Having been a fan of Wong Kar Wai films for many years, I was a little disappointed in this latest one. I suspect there was some pandering going on in terms of the genre, the cinematography, the overdone dramatic voice-overs. I am looking forward to watching Rigor Mortis; after such praises from you, I am really curious. No, no. I’m not Kozo. And I don’t have the chops or the concise and well-thought out opinion to be a reviewer of his caliber. Hahaha I can understand why whateves asked this, the concise break-down analysis might have some resemblance of Kozo’s. Which reminded me that I haven’t visited Lovehkfilm for a while, or watching a HK film for that matter. The fact that Miriam Yeung can win means HK is deprived of good calibre actresses. Yet, they don’t want more deserving mainland artistes to win. Miriam’s great in that that role and in all these years has turned into a charismatic and refined actress, what are you even talking about? I do think Sammi should’ve won that year but I’m not complaining about Miriam’s win. The CGI in the Grandmaster is poor, especially the fighting scene in front of the moving train. Agreed with u on that one……I m rooting for Anthony Wong for Best Actor Ip Man (TFF) & Unbeatable for Best Film…..I literally fell asleep watching The Grandmaster….maybe a piece of moving art…for someone but boring as hell to me & many as well…. It’s always the same bunch of HK actors up for awards. DRUG WAR should’ve been included among the Best Movie nominees. Johnnie To for best director and Donnie Yen for Best Action Choreography.